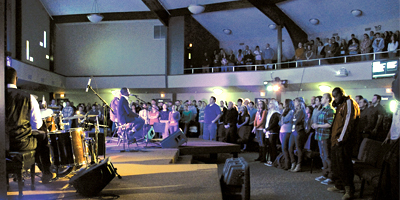 One of the many facets that make the KCU experience unique is our chapel services. Twice a week for 50 minutes, the entire campus community comes together in the Nash Chapel for a time of worship and teaching from God’s Word. Vibrant worship services are led by talented members of our student body. Each Chapel features a guest speaker who is typically a regionally or nationally known communicator. We make an effort to bring high caliber speakers to Chapel who have something to share that we feel will benefit our students and “nudge” them along spiritually. Chapel services have been a key component of the DNA at Kentucky Christian University since the beginning and set us apart from most other colleges and universities. Click here to stream chapel live!